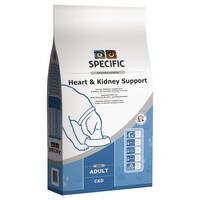 Specific Heart & Kidney Support CKD Dry Food for Adult Dogs is a complete and balanced diet designed to provide nutritional support for adult dogs with reduced heart, kidney and/or liver function. Made with high levels of Omega-3, reduced protein and a careful balance of essential vitamins and minerals, Specific Heart & Kidney will help to support your dog’s blood pressure, whilst reducing the workload on their kidneys. Additional Taurine and L-Carnitine also help to support the function of the heart. Maize Starch, Wheat, Rice, Fish Oil, Pork Fat, Potato Protein, Eggs, Antarctic Krill, Minerals (including Zeolite), Fish Meal, Hydrolysed Poultry Protein, Whey Powder, Powdered Cellulose, Vitamins and Trace Elements, Tri-Potassium Citrate, Taurine, L-Carnitine, Methionine.